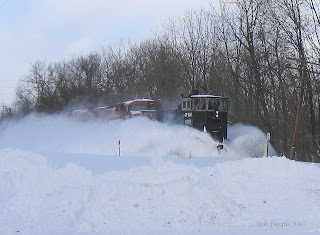 I don't get out much to railfan, but a plow extra is hard to pass up. 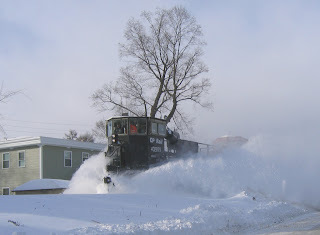 On February 15th, the day after the great storm, I was lucky enough to catch a plow extra running with a Jordan spreader on the Colonie Main, between Mechanicville and Albany. Above the train is recovering South Main Street in Mechanicville with snow. This is at the Albany Cemetery in Menands. Squeeky the railroad cat......Alex's cat Squeeky found a new home at Bill Michsler's house. 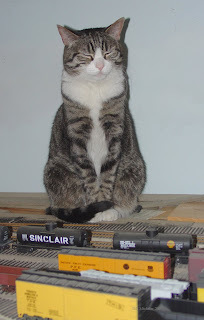 The cat really likes trains and feels at home with Bill. Construction on my HO Erie-Lackofmoney started in August of 2001. The area allocated for the layout was a small "L" shaped room in the basement equipped with recessed lights and sheet rock walls. The track plan soon found its way into the closet under the stairs since posts were going to block the right of way. After a little more planning, the middle section was conceived to be out of sight staging, under the display cases my late father-in-law built. As I began running trains, I felt that I needed a way to turn them back. This led to the invasion of the second closet and the "dog bone" style track plan. Plywood on "L" girders, Atlas Code 100 flex track and #6 turnouts make up the bulk of the layout. All connections are soldered. It was originally wired as a 2 cab-block system. I agonized over the decision to go to DCC. At the urging of Brad Peterson and Rob Dennis I converted. This was well worth it but changed my loco fleet profoundly. When I started, I had about 60 engines from multiple manufacturers to convert. Most of those were sold and the revenues from the sales led to purchases of DCC ready units. About 15 are on line with 6 more waiting in the wings for a decoder. I strongly recommend using DCC. I use the Atlas system and have 4 spots along the layout to plug in 1 of 3 controllers. I can follow the train around with the hand controller unplugged since the system has a memory. This layout models a fictitious division of the Dereco era (EL, D&H, N&W). The scenery is about one-fifth complete and could represent anywhere from NY to OH. Most structures are Walthers. The Cargill Mill and the Superior Paper Mill have been set up as "flats". Some of the buildings are ones my father built for me over 30 years ago. I enjoy using the Woodland Scenic's products. I recommend them but caution that there are a lot of things in their line that you may already have or can get much cheaper at a craft store. For example, a foam cutter they sell for $39.99 is also available at AC Moore for $8.99 If there is one thing I learned about working on the real D&H, it is that railroads are cheap and this one is no exception. There are almost 250 pieces of rolling stock on line with 85 more in the display cases. I have 1 passenger train and plan to add more. Some cars are weathered but most have knuckle couplers. I agonized over that conversion some 15 years ago. I wish I had completed my backgrounds at the beginning. This is the big struggle right now using various commercial components as well as a roll of shelf paper and blue spray paint. The future will bring signals, a dispatcher desk and working interlocking levers near the towers. My eldest son Broderick has contributed to the layout a farm he made at school. 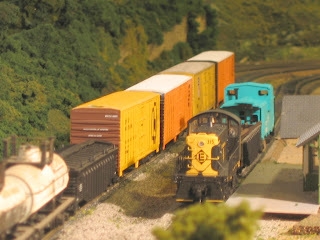 My sons are just starting to show interest in the hobby so maybe I will be a Train Master down the road. 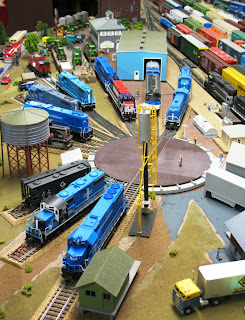 I would describe my HO Scale model railroad as a freelanced B&M based layout with D&H and other Northeastern roads well represented. 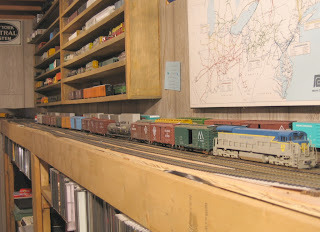 It is rather large, about 2/3 of our cellar, with 2 turntables, 2 reverse loops, 2 yards, & a double track wye leading off the mostly double track main line into the larger yard. My scenery is not bad, but it could definitely be better. I enjoy operating the layout often, but I now see the limitations of the DC operating system. 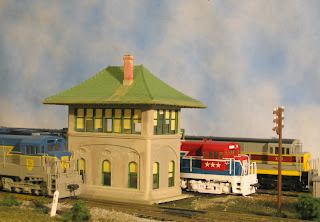 I was happy with it for years until I saw what DCC offers at Frank A’s layout. 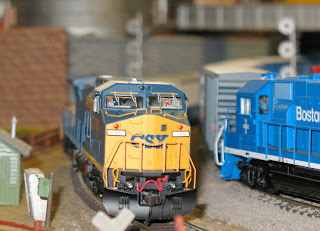 I moved the layout to Stillwater 6 years ago, which required major surgery including a complete rewiring of over 85 DC track blocks and 60 turnouts. As I mentioned before, I have not yet rewired my signals pending my impression of the new integrated Atlas system. I had some with Optoelectronic detection, some solenoid activated by turnout position and some that were just direct wired through on-off switches at the old house. I designed a novel method of wiring using standard telecom terminal blocks, which allows each layout module to be connectorized and provides the ability to isolate each section of every circuit if troubleshooting is ever required. I use typical Atlas control components with a few extra controls for power routing. The layout has 3 control panels and 4 MRC Power Supplies, including a hand held walk-around throttle network which is a bunch of RJ14 type modular phone jacks connected in parallel. I take a lot of pride in my trackwork too. Its code 100 and code 83 rail, and mostly flex track. It’s very reliable for smooth operations, but not a lot is ballasted. 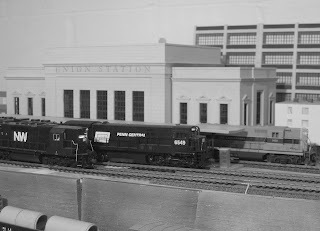 I have always modeled the “modern” era, but having been in the hobby since the 1970’s, what was once contemporary is now nostalgic. I always loved the D&H lightning stripe so it’s well represented. I operate a lot of GRS equipment, but also NYC. I try to group era specific items together in different sections of the layout, so you won’t see E-L or D&H Centuries pulling Pan Am 50’ boxcars. 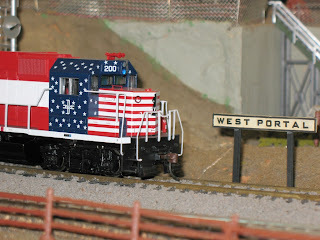 I prefer Atlas locomotives and newer Athearn, but you will also find some Proto 1 & 2 K locomotives that I found interesting on the roster too. The layout area is not a “finished” basement yet, but eventually it will be. I was the general contractor for the building of our home, so the layout was paramount in the design of the cellar. There are lots of windows to allow natural lighting and provide a good view of our woods. I feed many wild birds out there, so it’s common to see woodpeckers, turkeys, hummingbirds in summer, deer etc. from the primary operator’s control position on the layout. It’s also a walk out basement so you can go right from working on the layout to my trail network and landscaping.